Along with my colleagues Shelly Farnham, and Michal Lahav—and our interns Yuheng Hu, Emma Spiro, and Nate Matias—we have been exploring ways of discovering and fostering latent neighborhood information to help people understand what’s happening in their local communities. As part of this research, we have created Whooly an experimental mobile website that discovers and highlights neighborhood-specific information on Twitter in real-time. The system is focused, for now, on various neighborhoods of the Seattle metro area (King County to be specific). Whooly automatically discovers, extracts and summarizes hyperlocal Twitter content from these communities based on mentions of local neighborhoods and relevant keywords from tweets and profiles. One can think of Whooly as a neighborhood Twitter client. 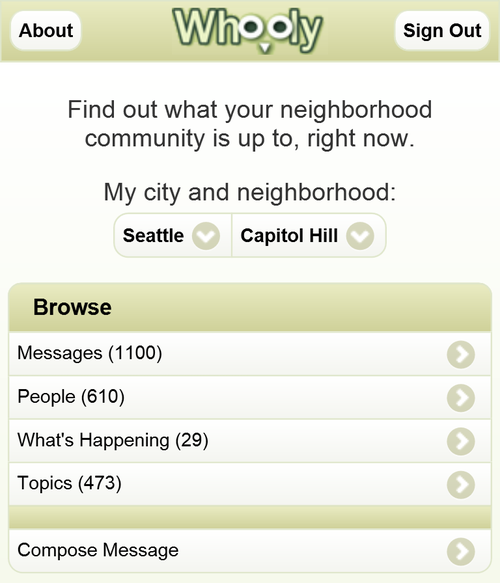 While Whooly is currently aggregating Twitter information for most of Seattle’s neighborhoods, our research will be focused on studying social media interactions and the impact of this particular system for a select number set of them, including:Capitol Hill, South Lake Union, Wallingford, and West Seattle. Many of your neighbors are already on Twitter and they’re talking to each other. 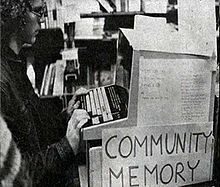 Some of those neighbors are community hubs who publish and curate timely and useful information. Just like cities have “Twitter Trending Topics,” so do neighborhoods, and they often represent neighborhood events. We have seen these ideas evolve and transform into systems like Craigslist, Meetup,Yelp, and Foursquare, among others. More recently, systems specifically targeting neighborhoods, like Nextdoor, have gained some of attention. However, some of the main challenges with these and any new social computing systems is that adopting a new communication channel is never an easy feat. This is what inspired Whooly‘s approach to build on existing communication channels to discover and highlight latent neighborhood communities. As we mentioned, it turns out neighbors are already talking to each other, it’s just hard to find this right now. Here is, for example, three network diagram of the conversations in three of the neighborhoods we examined. Whooly uses data like these to make its recommendations. If you live in Seattle, we invite you to start experimenting with Whooly and tell us what you think. As with any research project, there are plenty of kinks to iron out, but early feedback is incredibly helpful. Feel free to reach us at @whoolyit. Cross posted at the FUSE Labs blog.